However, it is a long way from chainsaws and cable skidders to a modern, high production stump to dump operation . In between is a story of hard work, perseverance and a continual striving for excellence in the profession. Gary explains that he purchased his own cable skidder at age 16, modeling after his father, Calvin who had the same line skidding business model. Father and son worked this way for several years until local regulations began to change in Saskatchewan and cable skidders were phased out. Gary and his father sold each of their cable machines and pooled their resources to purchase a grapple skidder. Agency Chiefs Tribal Council is a legally incorporated body comprised of three Indian Bands, Big River, Pelican Lake and Witchekan Lake. Its mandate is to contribute to the human, economic and social well-being of its members. One of the Council’s departments is AC Forestry. 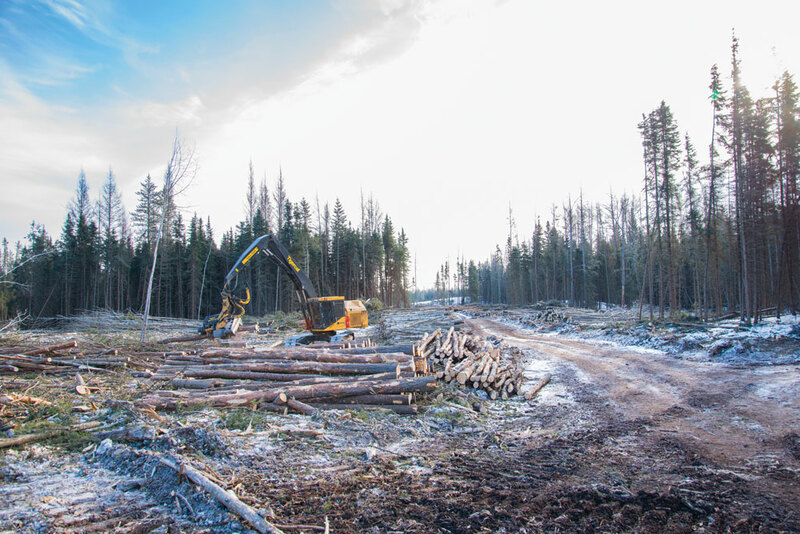 AC Forestry is in turn one of eight shareholders that owns Sakâw Askiy Management Inc. This entity was formed to jointly assume the Forest Management Agreement (FMA) and its management responsibilities. The FMA was previously held in large part by Weyerhaeuser which owned and operated the Prince Albert pulp and paper mill – shuttered in early 2006 due to poor market conditions. The Sakâw shareholders include First Nations and forest companies own processing facilities in Saskatchewan. They bring to the table a proven track record in business and sustainable forest management, along with the traditional knowledge of the First Nations. Planning, harvesting, hauling and renewal operations are carried out by each of the shareholders within specifi c operating zones in the FMA. The business leaves local decisions to those with the local knowledge while providing coordinated oversight at the FMA level (Sakâw). The Thomas family became a skidder subcontractor under AC Forestry in the nineties and continued until the Weyerhaeuser closure that left AC Forestry with virtually no harvest contract. Always the entrepreneurs, the family got into the food concession business, travelling to local Pow Wows. This period marks a rare departure from logging for Gary and Darren. “We always tip waitresses well. It is hard work being on your feet or in the kitchen all day,” says Gary speaking from experience. 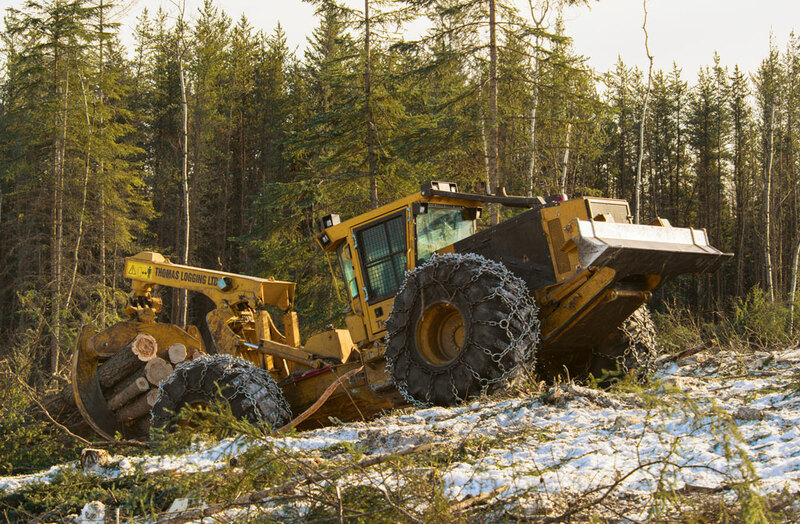 In November 2010 Sakâw Askiy Management Inc. acquired the Prince Albert Forest Management Agreement from Weyerhaeuser Canada on behalf of its eight member companies. AC Forestry ended up with an annual cut of around 700 000 cubic metres. 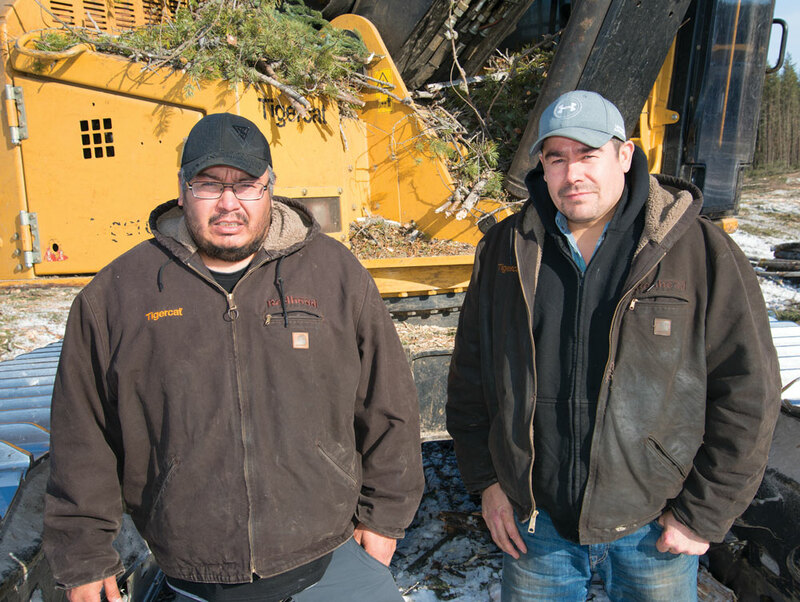 The brothers returned to AC Forestry, this time as employees. They did a fi ve-year stint – with Gary operating feller buncher and Darren on a processor. The brothers always believed in their own abilities, work ethic and high production output, so, in the back of Gary’s mind, he knew that he wanted a contract of his own. “They were always asking for contractors, so I just went in and asked for it,” Gary recounts. “A lot of guys said they won’t let us leave and have our own contract because they wouldn’t want to lose two of their best workers.” But now two years into the contract, Thomas Logging is producing well for AC Forestry and the new arrangement is turning out to be the proverbial win-win. The enterprise is owned by Gary, Darren and Calvin with strong support from cousin, Daniel Thomas. “Daniel stayed with us through it all, he is like a brother to us,” says Gary. Thomas Logging started with a used Tigercat 860 feller buncher and bought back the same grapple skidder that they owned when they subcontracted to AC Forestry fifteen years ago. Chuck Miles, forestry equipment sales specialist for Redhead Equipment stepped in and made them a deal on a new Tigercat H855C harvester paired with a Tigercat 575 head to complete the system. Two months into the first season, Thomas Logging purchased a second identical harvester unit from Redhead. 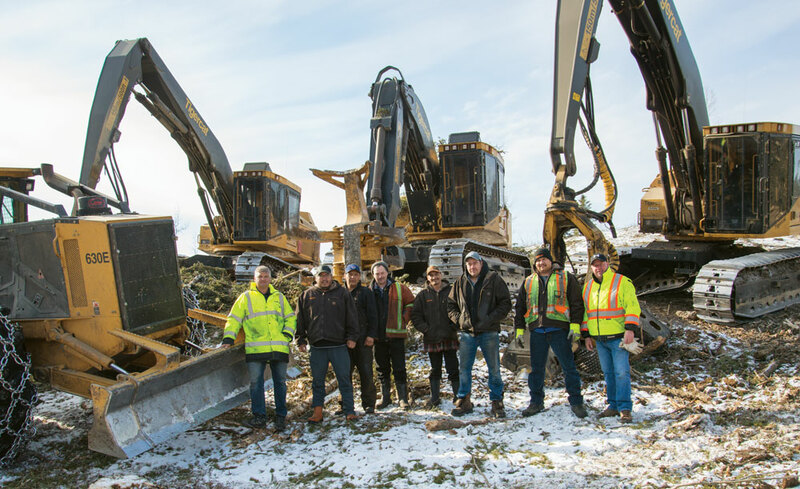 Now having just finished up their second winter season, the brothers have already relegated the used buncher and skidder to spare machine status. Through Chuck and Redhead, they acquired a new Tigercat 870C feller buncher and a new 630E skidder. BTB visited in late February with just a couple weeks left before spring break-up. The ground was characterized by steep draws and not a lot of fl at ground for decking. The timber, a mix of varying diameter aspen and spruce. The contract is a stump to dump contract, however loading and hauling is subcontracted out. The 4,8 m (16 ft) aspen goes to Tolko Industries Ltd in Green Lake and the soft wood goes to Norsask Forest Products in Meadow Lake, Saskatchewan, another Indigenous-owned enterprise. “This is hard ground, very hilly. It is tough on the processors and decking. With the processors we were really impressed. It is a good, tough machine. They really stand up,” says Gary. When asked what it was like to make the adjustment from employee to high production contractor, Gary shrugs. “Nothing too much different. I have always tried to look after things and run the show like a supervisor.” Gary feels that he has naturally progressed into a role of managing people because even as an employee he found himself taking responsibility and really caring about the job and the equipment. Gary is happy with the relationship with Redhead Equipment as well. 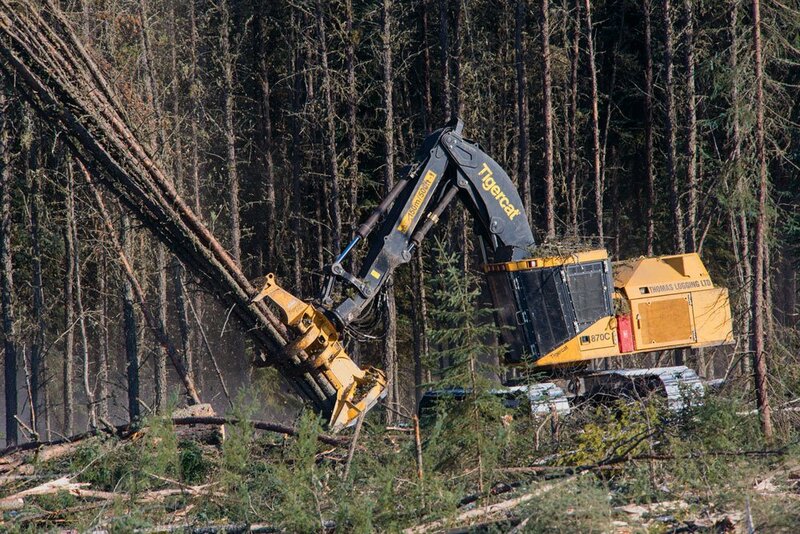 “The machines are solid and Redhead has been good.” Tigercat harvesting head customer support specialist, Blain MacDonald has also been integral to the successful start-up of the operations working with Thomas Logging and Redhead to ensure the processors were optimally setup and that the operators had the right knowledge out of the gate.